Here are some photographs of a Chinese Chess set made from poker chips and posterboard tiles. The pieces are made from poker chips. Images have been hand drawn on colored stickers, which have been affixed to the poker chips. The board is made from 2 inch wide posterboard tiles. White posterboard was used for most of the tiles, and a black rim was drawn around each tile with a black permanent marker. 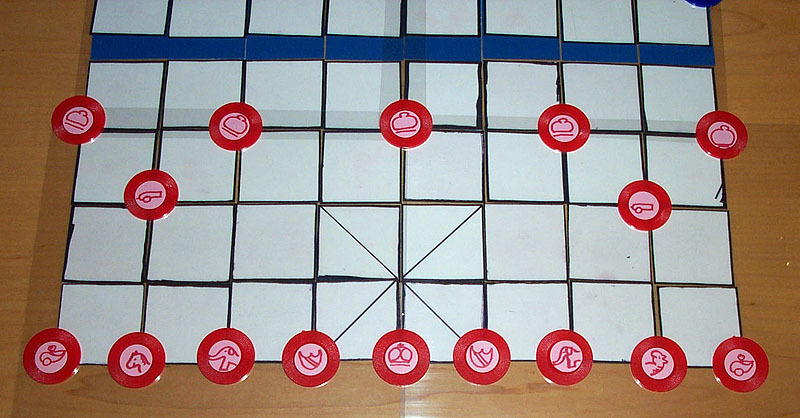 Diagonal lines were drawn on the eight tiles used for the two fortresses. 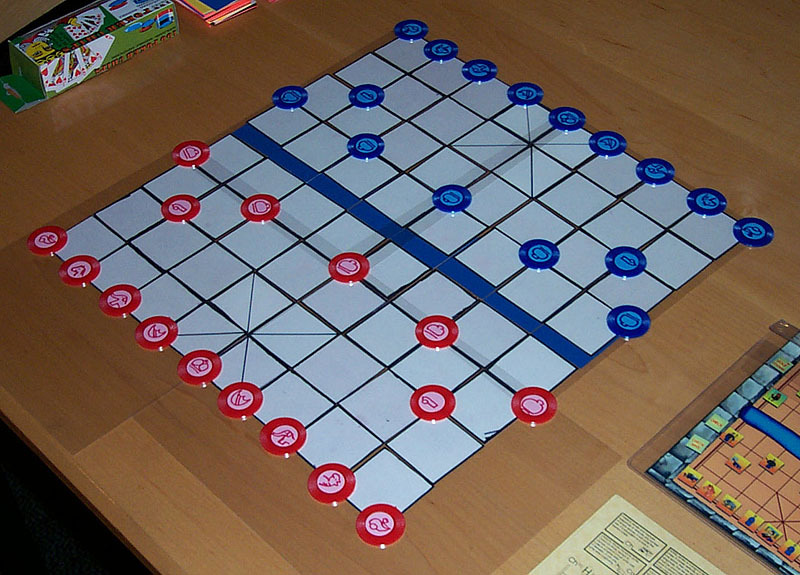 For the river, blue posterboard tiles were used. These were also two inch squares, but they are partially covered up. When we sat down to play, we learned that it would have been better to not cover them up. 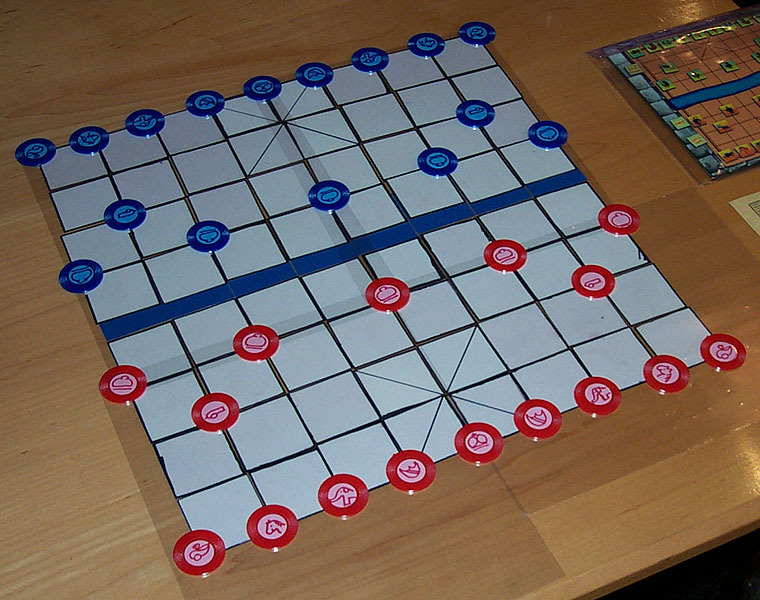 Some plastic sheets cover the tiles, so that they won't move out of place during play. The pieces and tiles were all handmade by Fergus Duniho. 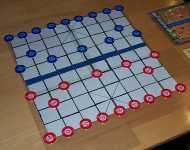 Fergus Duniho and David Howe set up the game pictured here. David Howe took the photographs. Click on the thumbnails to view the fullsize picture. The third picture shows the red pieces in greater detail. Chinese Chess Photos. Photos of a Chinese Chess set made from poker chips and posterboard tiles.